Menu Planning.... I love it and I hate it all at the same time however, I've learned it is a true time/money/life saver for my family. Like most families, a week or two of the month it seems we have plenty of money left over for groceries, and I can scour Pinterest for recipes all day long without fear of breaking my budget. THIS week, is not THAT week in my family. Like lots of families, it seems we have that week where ALL the bills are due at once. This IS that week in my household. In my 20's I really wouldn't have cared.... Here in my 30's, I plan the bills out, mark them on a calendar, plan the income, figure out what's left, and plan accordingly with meals, trips in the car to conserve gas, and plan to have a little socked back by the end of the week - and pray everything goes according to plan.... Read all this as - we're just a typical family! Ordinarily, I pick the recipes first, see what I already have in the cabinet, and then plan my grocery list according to what's NOT already in the cabinet/refrigerator/freezer. This week I'll be taking stock of what I ALREADY have, and pick recipes second. As luck would have it - I've got pork chops and ground beef in there. I know I'll need to conserve at the grocery store, but honestly, am I the only homemaker out there who thinks spaghetti and goulash sound GREAT - until you HAVE to make them because that's what's in the freezer? I'll also be trying to throw in some meals that I can cook ahead of time. I'm REALLY loving that. Primarily because it saves time during the week. I'm not stuck in the kitchen when I need to be helping the kiddo with homework, or I'd really rather be sitting on my couch after a long day at work. I actually enjoy cooking on the weekends because I get to take my time. I get to really read the recipes in detail and take in the whole process of combining ingredients and coming up with some batch of yummy goodness that my family will love! Okay.... After looking through the freezer.... I've got chicken for two nights, some of my freezer twice baked potatoes, and as luck would have it, I've got the meat all made up for Beef and Mushroom Stirfry that I never made, I've also got cube steak, pork chops, and ground beef for two nights. There's a thing of Pizza Dough in the fridge, and I've still got two things of dough to make pierogis, and the filling to go in them. This is totally doable. We won't starve (not that we ever do, I just tend to me one of those people who gets frustrated when we can't eat what we want)! YAY! By far this was the MOST difficult week to plan. Ordinarily it does not take me as long, nor do I stress over the ingredients as much as I did this week, but it looks like it's going to be a pretty good week. We'll be having a LOT of cube steak - but we'll still get to try a couple of new recipes. I'll also be cooking a Puerto Rican meal next week which has me excited. I once dated a Puerto Rican guy and had the pleasure of going to his grandmother's house for REAL Puerto Rican food - I can only HOPE that my Irish self can create the magic that dear sweet woman created that evening! Friday - New Pay Week - I see a drive thru in my future for this evening until the menu planning starts ALL OVER again! What are your go to meals when cooking on a budget? Don't forget to visit us on facebook and give us a like! 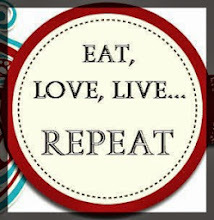 Eat, Love, Live... Repeat Official Facebook! You can also subscribe to my blog on the left hand side to get the latest updates via email! Comments and constructive criticism always welcome here!